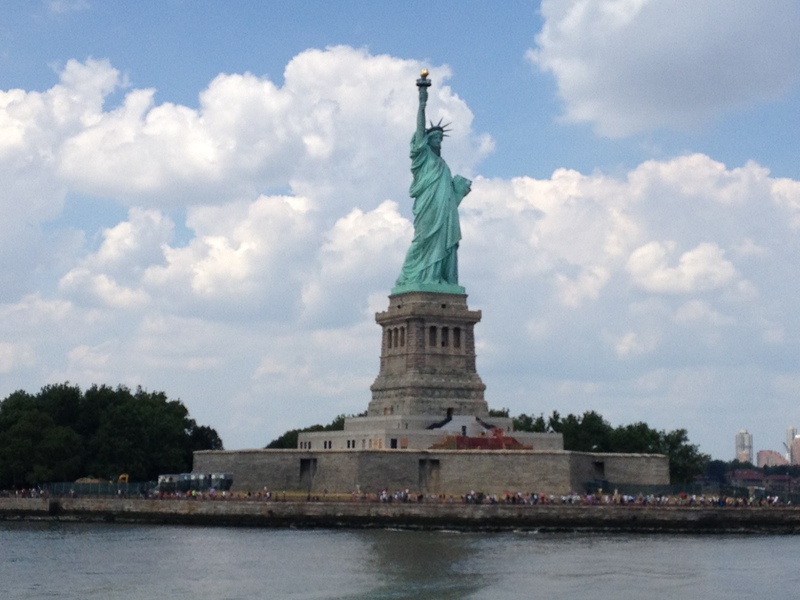 In the last week we have passed by the Statue of Liberty no less than 10 times on our way to and from Manhattan, Brooklyn and Queens from Staten Island on the ferry, on the Verrazano bridge and as we flew into LaGuardia airport. One can only imagine how it feels for an immigrant to see that Statue for the first time and know what it represents and has represented to so many. For some it is the promise of a job or a better chance at making it in this world. For others it is the Land of the Free. Freedom of speech, to bear arms, or to practice whatever faith you choose. But how many of us have really read and comprehended what the above quote, that is on the Statue of Liberty, states. “Give me your tired, your poor, your huddled masses yearning to be free. The wretched refuse of your teeming shore.” Our country was built on the premise that this was a place that people could come when they were tired, poor and in need of a leg up. I can hardly imagine how it must have been for my relatives that came from Germany, Poland, Sweden and other European countries to this land of freedom and plenty. This all came to life today for me as we had the privilege to serve beside our brother’s and sister’s in Christ from Community Bible Evangelical Free Church of Queens, NY. This church is a melting pot of people from all over the world that serves people from all over the world. As we worked beside them I heard so many languages spoken. And I thought about how each person there must have felt as they left their homeland to come to America. Each Saturday, this small church of about 100, holds a food pantry for between 900 and 1100 families from their very diverse neighborhood. According to New York City officials, it is the largest food pantry in the borough of Queens. Not only do they serve their own neighborhood, but God has provided so much food that at the end of most Saturday’s when all of their own people are fed, they are able to give to several other food pantries and soup kitchens in the area. As we listened to Pastor Kahemraj, he told us they wanted to make a difference in their community, a difference for the kingdom. Each Saturday, the families begin to line up at around 6 AM. At 8 AM a guest pastor gives a 20 minute gospel message and then offers a time of prayer for anyone that would like to learn more about becoming a Christian or is in need of prayer. The other really cool thing about this food pantry is that not only are the members of the church helping with the food distribution but so are some of the recipients. AND after everything is prepared for the families in line to get their food, the workers all get together to pray for the food, the recipients and each other. Then a free will offering is taken. While most of the food is donated, some of it is purchased and the offering is to offset these costs. They encouraged anyone, even if it was $1.00 to give to provide food for others. It was humbling to watch those that you knew had next to nothing give what they could. Almost every worker there was also a recipient. Then the King will say to those on his right, ‘Come, you who are blessed by my Father, inherit the kingdom prepared for you from the foundation of the world. For I was hungry and you gave me food, I was thirsty and you gave me drink, I was a stranger and you welcomed me, I was naked and you clothed me,I was sick and you visited me, I was in prison and you came to me.’ Then the righteous will answer him, saying, ‘Lord, when did we see you hungry and feed you, or thirsty and give you drink? And when did we see you a stranger and welcome you, or naked and clothe you? And when did we see you sick or in prison and visit you?’ And the King will answer them,‘Truly, I say to you, as you did it to one of the least of these my brothers,[f] you did it to me. So today as I think about what both the Statue of Liberty Quote and Matthew 25 say, I am so grateful today to live in a country that allows me to express my faith in Jesus Christ boldly, without repercussions. I am grateful that I live in a country where that freedom expresses itself in a love that feeds the “huddled masses”. I pray for our country today and the inalienable rights that we are given as American’s, but more for the inalienable rights I have been given as a daughter of the King of Kings to enter into a full relationship with Jesus Christ. Those rights are free to anyone! “For God so loved the world, that He gave His only Son, that whoever believes in Him should not perish but have eternal life.” The WORLD! That means you and you and you! And He doesn’t do this when we become perfect, because that won’t happen on this side of heaven. He did it while we were still sinners! Jesus, thank you for your sacrifice, thank you for your love and thank you for the people at Community Bible EFC that show your love so amazingly.